As I have for each of the last six years, I have the privilege of once again spending the week at TEDActive. The 700 folks at this year’s TEDActive watch the same TED talks as the main gathering via satellite. From what I can gather, the environment at TEDActive tends to be more engaged and enthusiastic than at the main TED. The audience skews younger, despite my efforts to increase the average age by being here. 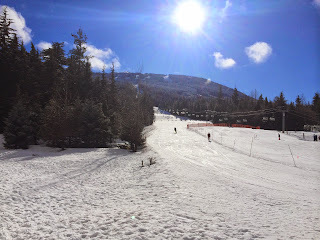 Unlike last year, which was in sunny Palm Springs, CA, TEDActive is at the ski resort town of Whistler in Canada. The main TED is a couple hours away in Vancouver. It is beautiful here, though with the winter I’ve had home in North Carolina, the warmth of Palm Springs would be welcome. I come to TEDActive primarily to force myself to think. The TED talks are usually thought provoking as are the attendees. I do my best to attend all of the talks. I also force myself to talk with people as that often turns out to be some of the best parts of the week. 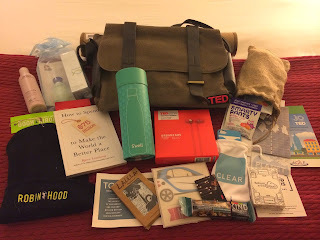 Before the sessions began I registered and got to see what was in my goodie bag. In previous years, these have contained all manner of things including some great gadgets. This year’s bag was a bit of a disappointment. The only gadget of note was a set of Urbanears headphones. Given the snow, the Robin Hood wool cap may turn out to be useful. The rest of the items are mostly things that will require some investigation on the Web to figure out if they are worth pursuing. The first set of sessions was a bit disappointing. 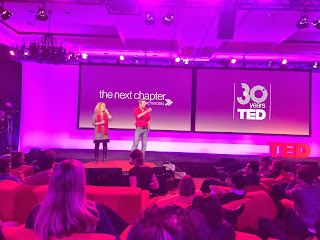 The theme this year is The Next Chapter which is meant to look back at the first 30 years of TED and forward to the next 30. Nicholas Negroponte seemed like the perfect person to get things started as he spoke at the first TED and has made a career of looking into the future of technology. Unfortunately, his talk seemed to consist mostly of showing how he had correctly predicted the future over his career. Other talks included a touching one by Malala’s father, Ziauddin Yousafzai, and some interesting musical observations and performances by Mark Ronson as well as some looks back by the host of TED, Chris Anderson. The best talk of the evening for me was by Chris Hadfield, a Canadian astronaut. He spoke amusingly and compellingly of his experiences in space. He also gave advice on facing your worst fears. The short form of the advice is that if you force yourself to walk into 100 spider webs, it will become routine, and ease your fear of spiders. Fortunately, I don't have a fear of spiders and don't have to do that! At the evening parties, I spoke with a number of interesting folks and forced myself to at least exchange greetings with the hosts of TEDActive, Kelly and Rives. All in all, it was a nice start. I’m looking forward to the next several days!